The United States and its international partners have a window of opportunity to reverse the deteriorating situation in Afghanistan. But it is closing rapidly. A failure to turn the situation around in the near future will allow Afghanistan to revert to a failed state that is a terrorist haven for Al Qaeda and affiliated terrorist networks. This week provides two key opportunities to recommit to Afghanistan’s security and reconstruction. On Tuesday, Secretary of Defense Robert Gates and other top military officials will speak to the House Armed Services Committee about the status of U.S. operations in Afghanistan and the way forward. Later in the week, the House is expected to pass the Defense Authorization conference report, which includes a Center for American Progress proposal to establish a Special Inspector General for Afghanistan Reconstruction. SIGAR is an important first step toward stronger oversight, particularly of reconstruction efforts, in Afghanistan. The Center for American Progress has also outlined a series of comprehensive solutions to re-energize and refocus U.S. policies toward Afghanistan. The mission of the United States and the international community is in jeopardy, and we cannot afford to lose. The good news is that we can turn the situation around in Afghanistan. The 40 reasons to reengage in Afghanistan listed below show just a selection of the reasons why it is even more vital now than ever before for the United States to recommit to its mission in Afghanistan, and why the U.S. mission can succeed. 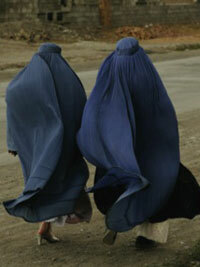 Afghanistan is one of the poorest countries in the world. Two-thirds of the population lives on fewer than two U.S. dollars a day. The adult literacy rate is only 28 percent. Life expectancy at birth for Afghans is only 43 years, and more than 20 percent of all Afghan children die before the age of five. Unemployment in Afghanistan is estimated to be around 40 percent. The Afghan government is publicly committed to promoting the advancement of women, but women still experience domestic violence, forced marriages, and roadblocks to education and economic opportunities. The Afghanistan Independent Human Rights Commission and the Afghan Ministry of Women’s Affairs registered close to 2,000 incidents of sexual and gender-based violence in 2006, and 57 percent of girls are married before the legal age of 16. Attacks on girls’ schools and athletic facilities have increased, and the chief of the Women‘s Affairs Ministry branch in Qandahar was assassinated in September 2006. The Afghan security forces have very few women in their ranks. Only 118 women, or less than 1 percent, were trained out of 71,147 police who received training by July 2007. In a society where many women are not allowed to speak to men outside of their family, especially in rural areas, this dearth of females in the police means that women have few channels to voice their concerns or seek help. Literacy rates for females are estimated at approximately 16 percent; one-third fewer girls attend primary school than boys. Afghanistan has the second-worst maternal mortality rate in the world. Maternal mortality rates are approximately 1,600 deaths per 100,000 live births—the highest rate of any nation outside sub-Saharan Africa. Last year was the deadliest year on record since the invasion in 2001, with more than 4,000 people killed. 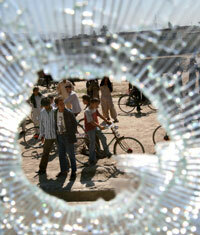 So far in 2007, more than 5,200 people have died in insurgency-related violence, including 750 civilians. Suicide and roadside bombings were up 25 percent in spring 2007. The International Committee for the Red Cross has stated that because of increasing insecurity, humanitarian organizations have diminishing access to provide aid and monitor the wellbeing of civilians for many areas in Afghanistan. Humanitarian organizations are increasingly seen as viable targets by the insurgency. For example, insurgents have attacked dozens of trucks carrying World Food Program food aid during the past several months, driving up security costs for humanitarian aid. Since Sept. 11, 2001, the Taliban has evolved from a fundamentalist religious group with narrow objectives in Afghanistan to a more sophisticated and diverse force with international goals, increased networks, and more sophisticated weaponry and tactics. In 2003 the Taliban operated in squad-sized units, but it now operates in battalion-sized units of more than 400 men—evidence of its growing strength. Suicide bombings, an Al Qaeda tactic, were never seen before 2001 in Afghanistan. Yet they jumped five-fold from 21 in 2005 to 139 in 2006, and they have increased by an additional 69 percent so far in 2007. The insurgency has filled its ranks by recruiting poor, unemployed, and disaffected youth in Afghanistan and Pakistan. Many of these foot soldiers do not believe in the ideology of the Taliban or Al Qaeda, but are drawn to the insurgency for financial reasons and/or disillusionment with corrupt local officials and basic lawlessness. The slow progress in building Afghanistan and providing more economic opportunities, as well as the return of many discredited warlords to positions of power at the local level, has turned many Afghans toward the Taliban. The Karzai government continues to have little control or presence outside of Kabul and therefore cannot maintain security or provide services and maintain the rule of law in areas outside the capital. Informal and traditional judicial structures such as jirgas and shuras are still estimated to account for more than 80 percent of judicial cases settled in Afghanistan. These informal mechanisms can and do play a positive role since they are more accessible, efficient, and trusted than formal mechanisms. But they also have serious problems; women have no decisionmaking role in them and male elders dominate, and some settlements violate Afghan state laws, sharia, and human rights. The Afghan government’s weakness allows terrorists to strengthen, criminal networks to grow and thrive, and infectious diseases, including HIV/AIDS, to spread unchecked. Afghanistan now ranks in the 2nd or 3rd lowest percentile of distribution on the index used by the World Bank to calculate corruption. 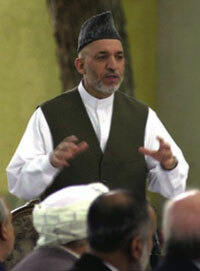 A 2007 report by Integrity Watch Afghanistan found that 60 percent of its Afghan respondents thought that the Karzai government was more corrupt than the Taliban, mujahideen, or Communist periods of rule, and that corruption contributed to a sense of disaffectation toward the state. Integrity Watch released a survey in March 2007, which found that half of the 1,250 people polled across the country had paid bribes in the previous year. President Karzai has appointed corrupt individuals to key positions throughout his government, especially at the senior level in the provinces, thereby undermining the state-building effort. 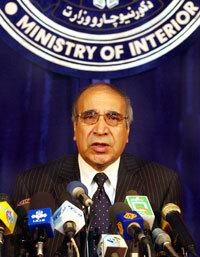 In response to riots against U.S. troops in May 2006, he appointed a strong local commander, Amanullah Guzar, to be police chief of Kabul despite his links to organized crime. He also gave senior police posts to former warlords and human rights abusers, including Baseer Salangi and Ghulam Mustafa. Because of failures in disarmament, demobilization, and reintegration programs, many regional warlords continue to possess local militias, which has allowed them to maintain their political power and force their way into the new democratic institutions. Afghanistan is now the number one producer of opium in the world, providing approximately 93 percent of the world’s opium. 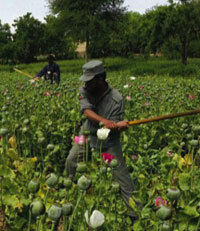 Opium revenues account for an estimated $3.1 billion—approximately one-third to one-half of Afghanistan‘s total GDP. From 2005 to 2006, there was a 50 percent increase in the number of hectares of opium poppy under cultivation, and a record 6,100 metric tons of opium were produced in 2006. In 2007, opium cultivation grew by another 17 percent, and opium production has increased 34 percent over last year. More Afghan land is used for growing opium than the combined total for coca cultivation in Colombia, Peru, and Bolivia. Drug traffickers and insurgents work hand-in-hand, benefiting from the insecurity and the absence of a governmental presence. The insurgents profit from the drug trade through taxing the drugs, preventing eradication, and protecting drug convoys. They may make anywhere from tens of millions of dollars to $140 million from the drug trade, which then provides salaries and money for weapons and training, including the training of suicide bombers. Opium production cannot be effectively curtailed without stable governance and real economic alternatives. In 2007, opium cultivation increased in insecure provinces, where lawlessness, weak governance, and corruption are rampant. As one United Nations Office of Drug Control survey found, approximately 20 percent of farmers in areas with good security grow opium, while 80 percent of those in areas with poor security do so. 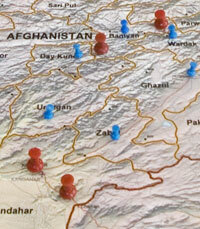 The total international troop level in Afghanistan is approximately 50,000. These troop numbers are inadequate to conduct counterinsurgency operations and secure territory, particularly in the south and east of Afghanistan. Even including Afghan security forces, they are one-tenth the number prescribed by U.S. counter-insurgency doctrine, which is usually a minimum of 20 counterinsurgents per 1000 residents, or about 480,000 troops for Afghanistan. 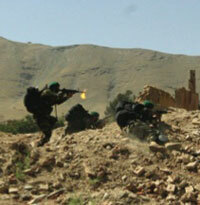 The Afghan National Army must be able to conduct operations on its own, yet they are under-manned and under-resourced. Furthermore, there are currently only 20 Operational Mentor Liaison Teams to provide training and mentoring to the Afghanistan National Army, although it would take more than 100 to train the entire Afghan army. Jean Mazurelle, the former World Bank director in Kabul, has estimated that international aid wastage rates are between 35 and 40 percent, and has observed numerous instances of fraud and looting, often by private companies. A 2005 audit of the U.S. Army Corps of Engineers’ reconstruction work found that projects had not been properly executed and were awarded to expensive contractors where more competitive offers existed. Between problems with contractors and the endemic corruption and graft in Afghanistan‘s government, U.S. and U.K. officials have estimated that up to half of international aid is siphoned off by corrupt police and tribal officials. The Canadian government may be forced by political pressures to withdraw troops in 2009. The Canadian people believe that they are bearing a disproportionate share of the costs; they have lost approximately 70 troops since 2001, approximately 27 percent of non-U.S. deaths. Other NATO member countries, such as the Netherlands and Italy, are also feeling pressure from their publics to withdraw. 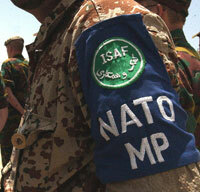 Failure in Afghanistan would throw NATO’s relevance into doubt. This is the first out-of-area mission for NATO, and it has committed to help “establish the conditions in which Afghanistan can enjoy…a representative government and self-sustaining peace and security.” As Sen. John McCain (R-AZ) has declared, “If NATO does not prevail in Afghanistan, it is difficult to imagine the alliance undertaking another ‘hard security’ operation—in or out of area—and its credibility would suffer a grievous blow.” NATO and other foreign officials have echoed these views, believing that if they fail to meet their stated commitments, they will be seen as unreliable and ineffective. From their sanctuary in Afghanistan in 2001, Osama bin Laden and Al Qaeda trained for and organized the attacks of September 11. Although the current administration has portrayed Iraq as the central front of the “global war on terror,” Afghanistan and the borderlands of Pakistan remain the central battlefield. Al Qaeda Central is currently based in the borderlands of Afghanistan and Pakistan and is a threat to the United States, its allies, and its interests.